Earth Science Week is October 14-20, and it is the perfect time to show our appreciation for our home planet! Each day of the week focuses on specific geoscience-themed celebrations. 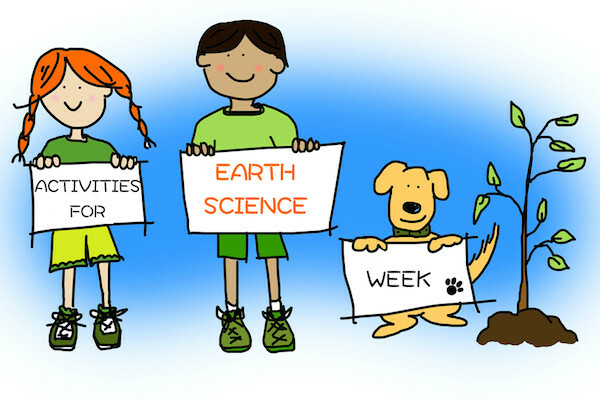 To help you and your students partake in this year’s events, we have put together a list of activities for each day of Earth Science Week. STEM contests and competitions are a fun way to engage students in learning. The American Geosciences Institute offers several contests as part of Earth Science Week. Students in kindergarten through fifth grade may enter a visual arts contest, while an essay contest is open to students in sixth through ninth grade, and a photography contest and a video contest are open to all ages. What better way to kick of Earth Science Week than with a scavenger hunt? EarthCaching is geocaching with a geoscience twist. Gather the kids, their phones or any portable devise with GPS technology, and head outdoors to find some educational treasures. The EarthCaching Educator’s Guide, put out by the Geological Society of America, provides all the background information, tips, and lesson plans required for parents and teachers to get their students started with earthcaching. Ready to find an earthcache? Consult this searchable list to locate a nearby earthcache. Earth Science Literacy Day focuses on the “Big Ideas” that we should all understand about earth science. Start by watching the Big Idea videos by the American Geosciences Institute. Then, why not take the opportunity to hook children on learning about our planet through reading? Below are a few of our favorite fiction books that feature geoscience themes. Most of these books complement Big Idea 6: Life Evolves on Earth and Big Idea 8: Natural Hazards Affect Humans! Young children will enjoy the creative rhyming and variety of dinosaurs dancing it up at the dinosaur stomp. Adults will enjoy the way geologic time is interwoven throughout this rollicking story. The beloved Magic Tree House series begins in the prehistoric past with Dinosaurs Before Dark. Early readers that have already started the series can skip the later geo-themed books, Vacation Under the Volcano or Earthquake in the Early Morning. Older elementary students who are fans of adventure and historical fiction will flip through the pages of this story about the eruption of Mount Vesuvius. Related books in this series include, I Survived the San Francisco Earthquake, 1906 and I Survived the Joplin Tornado, 2011. What better way to appreciate what the earth’s surface offers us than to take it away? Middle school readers will want to keep the lights on and find out what happens when the power goes out in the underground city of Ember. High school students who enjoy disaster fiction will be drawn into the post-apocalyptic world of Ashfall. However, in this novel, the force that destroys the earth as we know isn’t aliens or governments, it’s our very own Yellowstone supervolcano. Time to go outside! Geoscience happens outdoors, so take advantage of this day and get your students and children outside with these activities. Coordinate an outdoor geoscience activity with a local earth science organization or setup education stations in your own backyard or school grounds. If you teach or know any fourth grade students, take this day to get them signed up for the Every Kid in a Park program. The pass allows all U.S. fourth grade and home-school equivalent students and their families to visit hundreds of national parks, forests, and wildlife refuges for free. Bonus, the pass is good through the end of August, making it the perfect motivational tool for getting outside all year long! Take advantage of Earth Observation Day by engaging your students in practical applications of Earth Science data. Introduce your students to remote sensing with one of these lessons or activities or connect with a remote sensing scientist. Visit the Earth Observation Day website to get started! If you are fortunate enough to have fossils on-hand for students to examine, then today is the day to do so! If not, don’t worry, students can still participate in National Fossil Day with these activities. Take students on an interactive adventure to the past without leaving the classroom with the Fossil Mysteries interactive. View fossils on exhibit at the Smithsonian’s National Museum of Natural History with the NMNH virtual tour. Explore online paleontology games and activities from the American Museum of Natural History. Try our free Fossils online lesson too. Get creative by entering the National Fossil Day Art Content. The winning submission for each age group will be featured on the official National Fossil Day website. How do we manage our mineral resources? Can we predict natural hazards? Could we survive on Mars? These are all issues geoscientists grapple with on a daily basis. Geoscience for Everyone Day is set aside for students to learn about geoscience careers. Allow your student to explore future career paths today. Science Buddies offers a great collection of job overviews and education and training information for those interested in Earth and Environmental Science careers. PBS’ Dragonfly TV features videos about Real Scientists, including an ocean scientist, meteorologist, marine geologist, and paleontologist. Geologic Map Day is dedicated to the important role geologic mapping plays in society. Geologic maps tell us much more than the location of roads and landmarks. Instead, they tell us about the history of the earth below our feet – the types of rocks and their ages, fault lines, and folds, all essential information for land-use planning. For those unfamiliar with geologic maps, a primer is in order. Start by reading the Geologic Maps site by the US Geological Survey and the National Parks Service, then, explore the One Geology Portal. Get hands-on and try interpreting a geologic map. Okay, it’s not quite that simple, but there are some excellent tools and lessons available. Start with the Visible Geology interactive, What’s Under My Feet, Geologic Maps and Groundwater, or Geologic Maps & Earthquakes. Earth Science Week wraps up with International Archaeology Day, the perfect opportunity for families to experience the real-world intersection of geoscience and history. The Archaeological Institute of America’s website has an interactive map and searchable database of Archaeology Day events happening around the world. Chances are there is a family-friendly tour, open house, fair, or exhibit near you. Some archaeological sites allow volunteers to join in the dig free of charge. Search for potential volunteer opportunities here. If you and your students can’t participate in a dig, then go virtual with InteractiveDigs.com. Looking for more ways to learn about planet Earth? Visit HelpTeaching.com and try our free Earth Science printables and lessons.